Jeffrey Dean Morgan’s villainous Negan’s front and centre in the first poster for The Walking Dead season 7. Season 6 ended on a breathtaking cliffhanger, as Negan selected one of Rick’s group to make an example of by doing their head in with his weapon of choice, barbed wire covered baseball bat ‘Lucille‘. So this new poster, showing the lineup of Negan’s potential victims, is bringing all of those haunting memories back up. 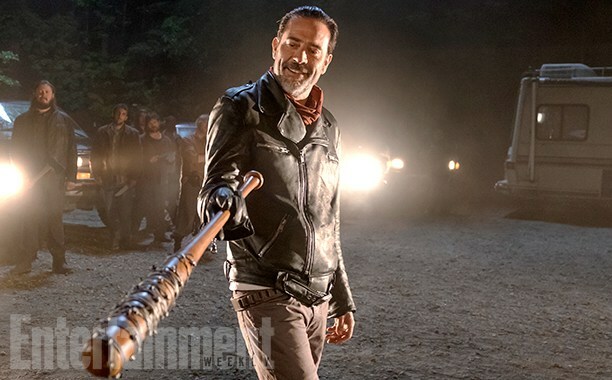 “Who was at the receiving end of Negan’s bat will be revealed in the first episode”, director and executive producer Greg Nicotero confirmed in an interview with Entertainment Weekly. “He’s the kind of guy who imagines himself on stage at a high school production and he loves every second of it”, Nicotero continued. “So, I don’t really see a lot of quiet contemplative moments with Negan. I feel like with Negan it’s really going to be about him gesticulating and him sort of relishing in the sound of his own voice while he commands the stage in front of whoever’s alive”. The victim’s identity was revealed in the pages of comic issue The Walking Dead #100, however there’s nothing to say that the show won’t diverge from its source material once again. We’ll just have to wait and see what happens when The Walking Dead returns in October.